On Tuesday, July 29th, after over nine months in custody and an extended trial which took place over the course of several months, Mi’kmaq Warrior Society members Germaine ‘Junior’ Breau and Aaron Francis were finally sentenced for their involvement in an RCMP raid of an anti-shale gas encampment near Rexton, New Brunswick in October last year. The Mi’kmaq Warrior Society acts as an independently-run defence force for the Mi’kmaq peoples, the largest group of Indigenous peoples in the Maritimes. From time to time, as when community members from Elsipogtog First Nation in New Brunswick requested their assistance in dealing with overly-aggressive RCMP and an American-based gas company unlawfully seismic testing on traditional lands, the society comes to the aid of embattled reservations. It is important to note that the Society also maintains a distance from Indian Act-appointed Chiefs and Councils. It is “treaty-based” in that its political affiliation, if it can rightly be called such, lies with the treaties of peace and friendship that exist between the Crown and the Mi’kmaq peoples and their Indigenous allies. None of these treaties cede the traditional territory of Mi’kma’ki, which ranges from Newfoundland to Maine, upwards to the Gaspe peninsula, to the Crown. Meaning that title of these lands rests firmly in the hands of its Indigenous inhabitants. In the end, after the Crown negotiated with the defence team of Alison Menard and Gilles Lemieux over numerous lesser charges (a full list of which can be found here), presiding Judge Leslie Jackson found Breau guilty of one count of criminal code section 88—possession of a firearm, and five counts of pointing a firearm at a peace officer. Francis, for his part, was found guilty of one count of firearm possession, but was found not guilty of the four major charges against him, all related to allegedly tossing Molotov cocktails. While the Crown sought a sentence of five years for each man, Judge Jackson sentenced both Breau and Francis to 15 months, meaning that with time-served both men will be reunited with their families and communities in a matter of weeks. The case, to be sure, was politically charged on a variety of angles, the least of which is the province of New Brunswick’s investment and championing of the shale gas industry. After a multi-million dollar provincial expenditure for RCMP escorts and security for SWN Resources Canada’s staff and equipment and the culmination of which was the inter-provincially managed and executed raid of October 17, 2013, in which hundreds of RCMP from across the country participated—by the end the province had very little in the way of arrestable and chargeable peoples to show for it’s gambit. Nor has SWN—the Texas-based gas company that New Brunswick is so eagerly courting—come away with what it desires. Despite a promise to return in 2015 and a tongue-in-cheek “thanks to the people of New Brunswick” in a final goodbye press release, SWN Resources Canada did not manage to complete all of its planned seismic testing activity for 2014. Two of SWN’s four seismic ‘lines’ were completely abandoned after a shot-hole driller—a piece of equipment estimated to cost around $380,000 —was torched, and other equipment destroyed by unknown, but fiercely anti-shale gas, vandals. No arrests have ever been made in connection with these blows to SWN’s deep, but nevertheless pregnable, pockets. Indeed, 2013 was the third year that SWN attempted to make good on its multi-million acre exploration lease in New Brunswick, and neither it nor the province have much to show for it in terms of usable seismic data. And despite their best efforts at a public campaign meant to spread the gospel of hydraulic fracturing, which included sponsorships of high school science shows and the like, the outlying rural regions of New Brunswick that have been the focus of SWN’s efforts have proved resilient to pro-shale gas spin. And year in, year out, their anti-shale gas populace has demonstrated itself to be hands on and battle-ready. 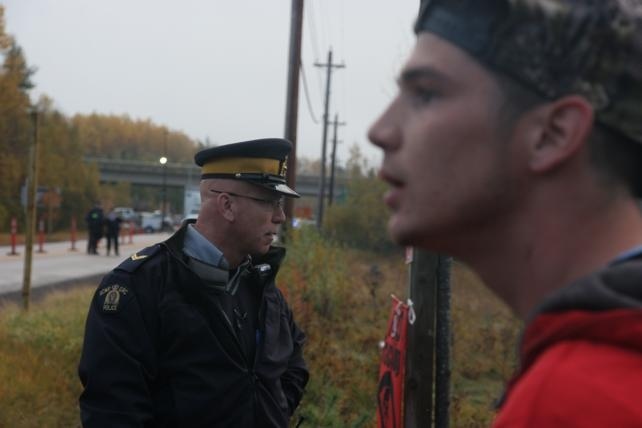 No, the only card really left in the ruling provincial Conservative party’s hand—after seeing its own popularity tank in the popularity polls after its brutish handling of the shale gas issue and others—was the opportunity to make an example of two young Indigenous men who were involved in the October 17, 2013 raid; Breau and Francis. In that regard, Judge Jackson, in giving both young men a sentence of 15 months, managed to dodge something of a political hot potato. His decision might also speak to the political bankruptcy of the New Brunswick Conservatives, in terms of lack of judicial influence. If Jackson were to find the men guilty and sentence them to years in prison, he would risk providing usable material to those who take existing and binding nation to nation treaties seriously. Breau and Francis, in their own right, are considered to be prisoners of a 500-year war of colonization; their only crime being the defence of their traditional territory against an invading corporate and Crown agenda given muscle through the RCMP. On the other hand, despite a harsh upbringing documented in their respective ‘Gladue reports‘—the detailing of family history that a defence can submit during sentencing to ask for leniency for Indigenous offenders—for Judge Jackson there did remain the sticky situation of gun handling and pointing, which remained no-nos for anyone not wearing a police uniform on the morning of October 17. I did not see Germaine Breau point a gun at anyone on the morning of October 17. My attentions that day were more focused on being caught in the cross hairs of numerous pistol and assault-rifle wielding men crouched in ditches and creeping through the dewy field where we had been camping. It was not the first time that men sanctioned by the state had trained their guns on me, so it isn’t like my worldview came crumbling down. But it is also a day I won’t forget. If Breau did point a rifle, as the court has found him guilty of, the fact that this action has received the vast majority of the public’s attention speaks to a general acceptance of state violence and warfare over the rights of Indigenous peoples. Indigenous peoples, when organized into their own security force, to defend themselves using the state’s own techniques, are imprisoned. Or worse. As for Judge Jackson, to simply give the men time-served would come dangerously close to endorsing acts of weaponry against peace officers, if done so in the ongoing fight for unrecognized treaty and water rights—both currently acknowledged, if not embraced by all, in the anti-shale gas movement in New Brunswick. Jackson did admit that the context, the fight for water, was relevant to the sentencing, which is likely the best nod the veteran Judge could give to the cause in this, 2014 New Brunswick. No, time-served would be one step too far at this moment in time, where Crown law and order remains the best legal option available, at least for the dominant class. So Jackson deftly danced the middle ground, with a barely noticed stutter step towards Indigenous sovereignty. It’s still not alright to point guns at cops, even if they have pointed at you in a pre-dawn raid on your campsite, but the context and the offender’s history and upbringing does matter. And thankfully nobody got hurt on October 17, an RCMP effort organized for whose planning for maximum RCMP confrontation with what had until then been a peaceful protest that I write about in more detail here. In any case, with about 14 months already served, Breau and Francis will be out of prison in a matter of weeks, and will yet catch the calming breezes of late Mi’kma’ki summer, 2014. Posted on August 5, 2014, in Oil & Gas, Warrior and tagged Aaron Francis, Elsipogtog First Nation, Germaine Breau, Mi’kmaq, Mi’kmaq Warrior Society, native blockades, native resistance, New Brunswick shale gas protests, RCMP, RCMP and Natives, SWN Resources Canada. Bookmark the permalink. Leave a comment.